Steven Stamkos increased his NHL goal-scoring lead to 26 with his second hat trick this season in a 5-2 Tampa Bay victory over the Carolina Hurricanes on Saturday. Guy Boucher obviously enjoys Steven Stamkos' offensive skills. The Tampa Bay coach is also impressed with the high-scoring centre's improving defensive play. Stamkos had his second hat trick this season and fifth overall to lift the Tampa Bay Lightning to a 5-2 victory over the Carolina Hurricanes on Saturday. "His back-checking ... four or five times he was just a jet out there," Boucher said. "You know what? He's part of the team." Stamkos scored his third goal of the game and 26th of the season from the left circle on a power play 43 seconds into the third. Just 22 seconds later Tampa Bay went up 4-2 on a goal by Teddy Purcell. Tampa Bay Lightning defenceman Victor Hedman has a concussion and will be sidelined indefinitely. Lightning general manager Steve Yzerman announced the injury during the first intermission of Saturday's game. Hedman was hurt in Tuesday night's game against Philadelphia by what Yzerman called a clean check. The defenceman has averaged almost 22 ½ minutes a game this season. He had two goals and four assists. He has not resumed working out. "He's pretty hot," Lightning right wing Martin St. Louis said of Stamkos. "He's flying." 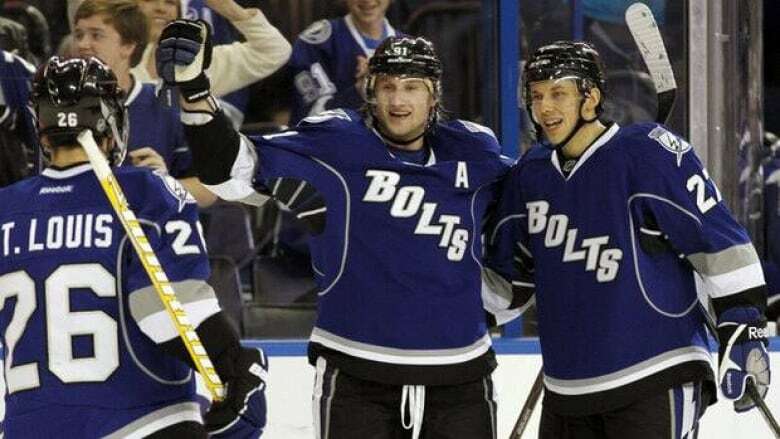 "That was icing on the cake," Stamkos said of his hat trick. Carolina, 1-7-2 in Southeast Division games this season, got goals from Justin Faulk and Jay Harrison. "Tampa was ready in the third and we weren't, and they outplayed us," Hurricanes coach Kirk Muller said. Hurricanes captain Eric Staal had two assists, giving him three assists and five points in his last two games. St. Louis, who finished with three assists, recorded his 500th career assist on Stamkos' third goal. "I'm proud of that," St. Louis said. "It's an honour to play this game." Steve Downie scored a third-period goal at 6:51 and also had two assists for the Lightning. Mathieu Garon made 24 saves. Carolina's Cam Ward stopped 27 shots. After Harrison scored a power-play goal 4:29 into the second, Stamkos got Tampa Bay even at two from the slot at 8:17. "He's a world-class player," Muller said. "When you give him opportunities like that, he's going to capitalize. He plays at a high tempo. He's a natural goal scorer, and he makes players better around him." Faulk tied it at one on a rebound power-play goal from the low left circle with 3:48 remaining in the first. The Hurricanes entered play with the NHL's third-worst power play. "I think once they got that third goal, our play broke down there," Faulk said. "We've got to learn to play 60-minute games."